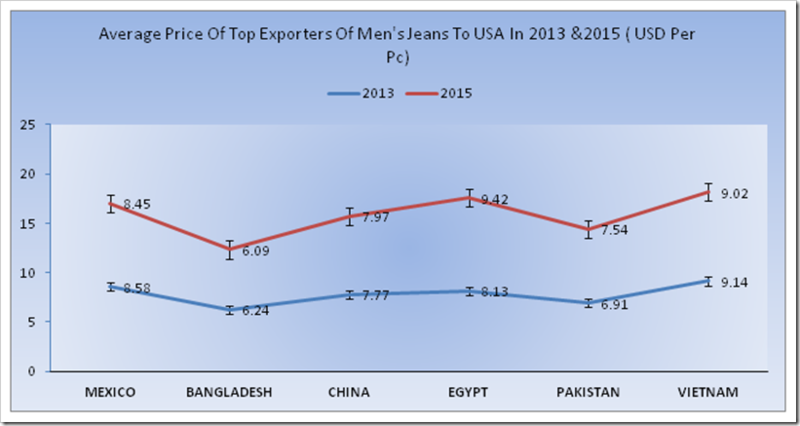 Exports of Denim apparel to US from different countries around the world has show varied patterns but on the whole the imports in the period Jan – May 2016 were down by over 5%. 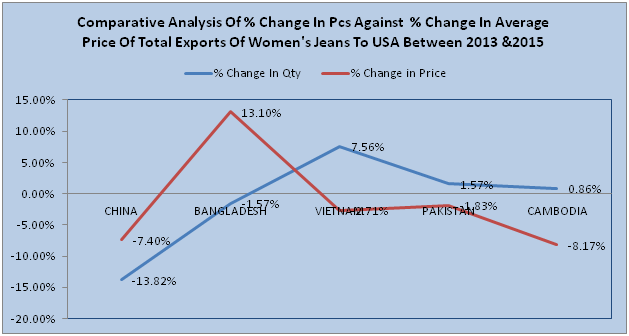 The exports fell most from Sri Lanka and rose most from Vietnam to USA as we can see in the table below. The exports from China and Mexico also fell though Mexico felt more heat due to its 8.2% fall. 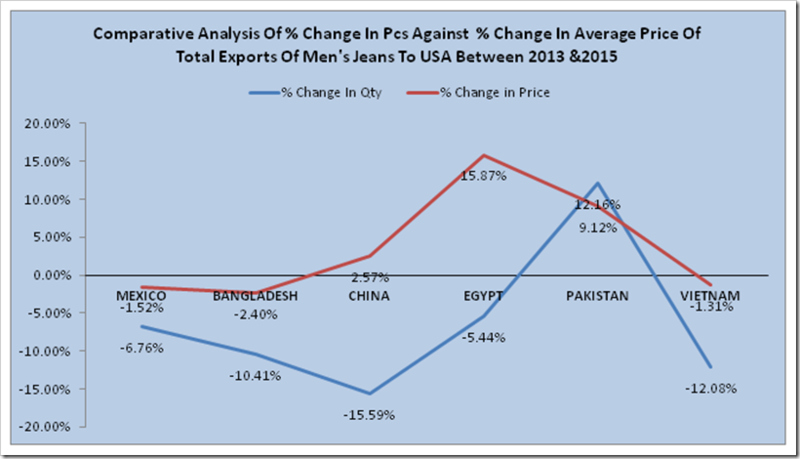 Further to the figures of 2016 , it would also be imperative to see what happened in the last three years and how the different countries have been performing in relation to their denim exports to US. We bifurcate the exports from these countries in the Men’s and Women’s category and analyse how each of the major exporter is performing in these categories. In 2013 and 2015 , Mexico exported 109.12 & 101.74 million pcs respectively, however there was a slight downfall of 6.8% in the export quantity in 2015 . 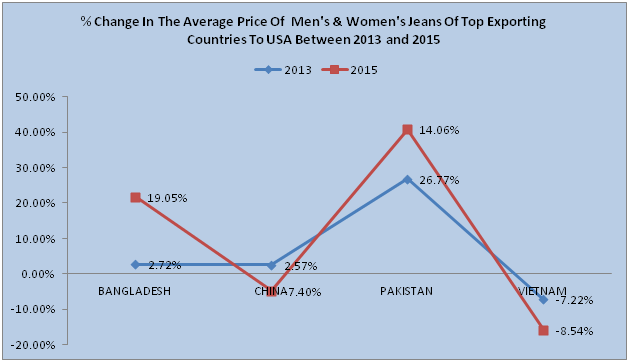 Except Pakistan, all the countries followed the downward trends in 2015. The largest downfall has been registered by China which was 15.6% in 2015 . 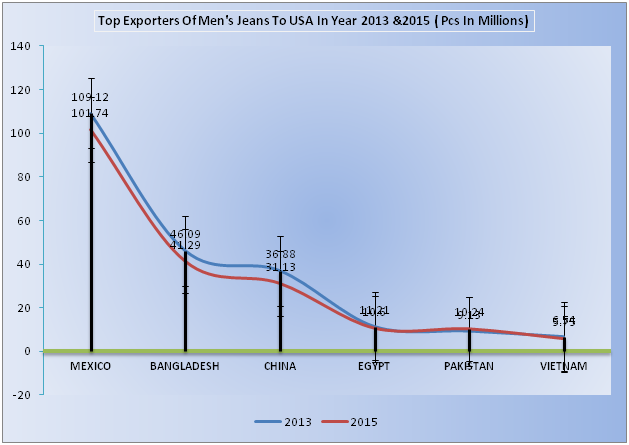 It is only Pakistan which managed to keep an increasing trend with a growth of 12.2% in 2015 as compared to 2013. 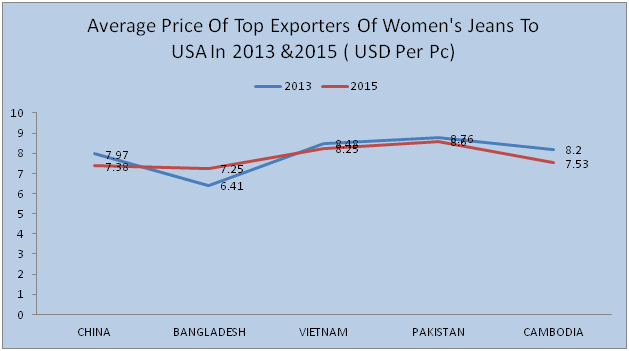 In 2013 , Bangladesh was the least expensive with the average price of USD6.24/pc while Vietnam was the most expensive with USD9.14/pc. 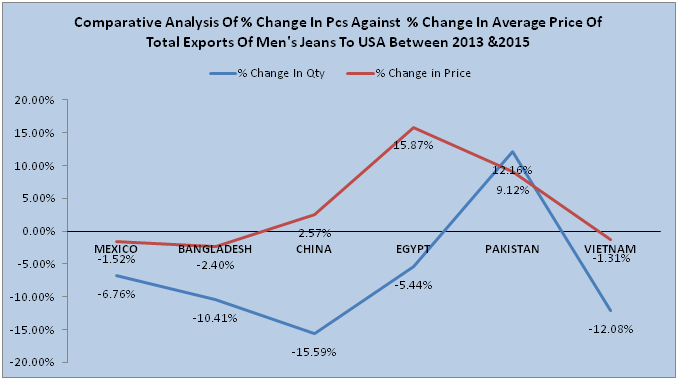 In 2015 , Bangladesh exported at the lowest average price to USA that is only USD6.09/pc and the Egypt became the most expensive exporter to USA at the average price of USD9.42/pc. 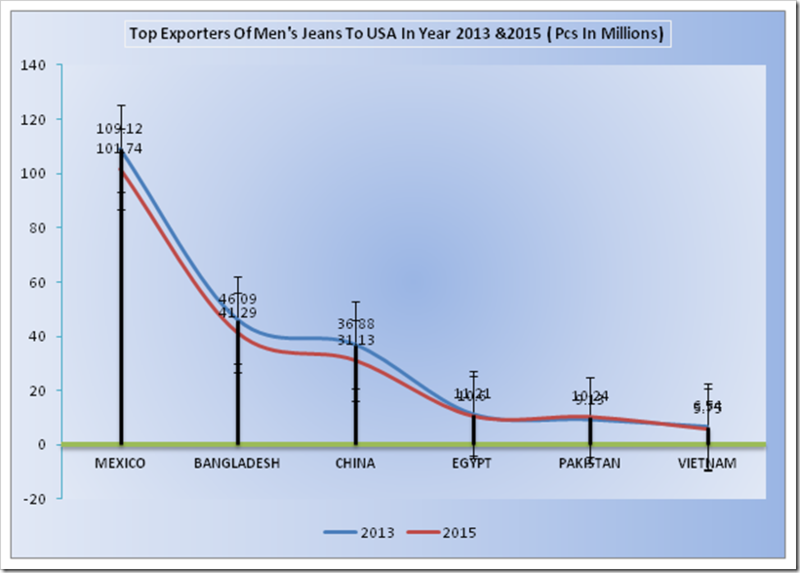 In 2013 and 2015 , China exported 118.36 & 102 million pcs respectively, however there was a downfall of 13.82% in the export quantity in 2015 . 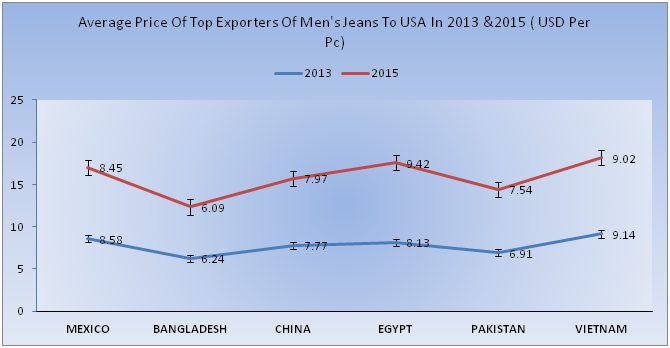 The growth story of all other countries between 2013-15 is not so encouraging and has a very slight upward movement in terms of export quantities .The largest downfall has been registered by China , however fall of 1.57 % in the export of Bangladesh is also not a good sign. 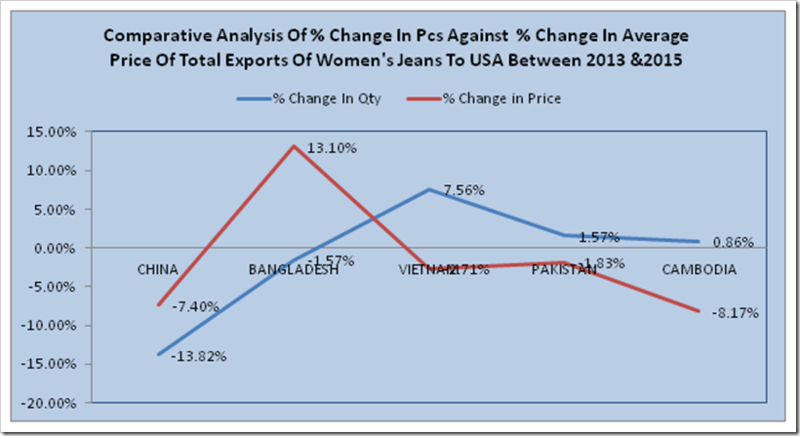 Vietnam surprised with a growth of 7.56 % in 2015 as compared to 2013 and it is because of much awaited TTP which is expected to be signed very soon. 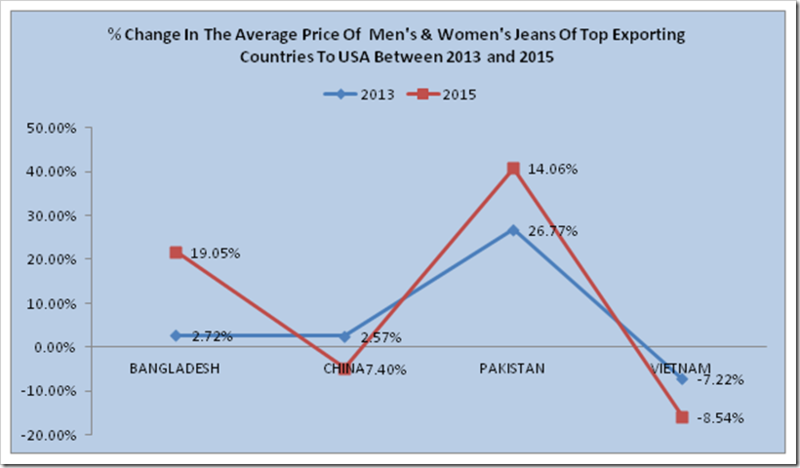 In 2013 , Bangladesh was the least expensive with the average price of USD6.41/pc while Pakistan was the most expensive with USD8.76/pc. 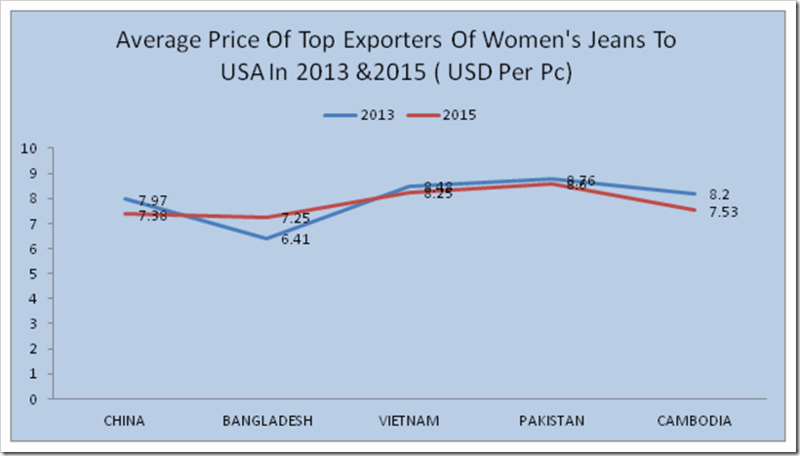 In 2015 , once again Bangladesh exported at the lowest average price to USA and that is only USD7.25/pc and the Pakistan became the most expensive exporter to USA at the average price of USD8.6/pc. 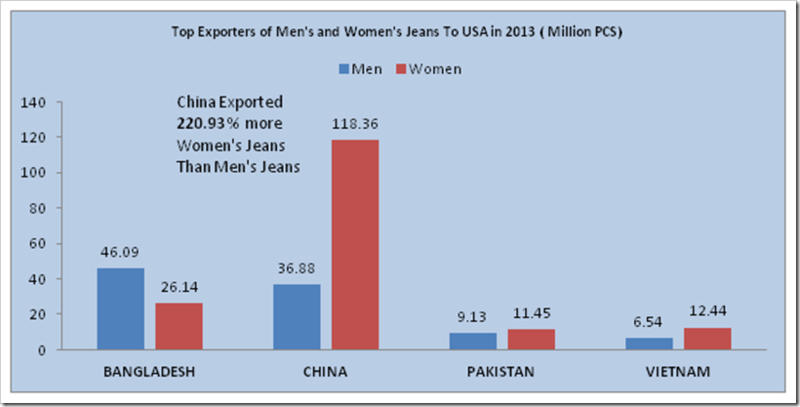 This analysis clearly shows that , China exports more of Women’s Jeans to USA as compared to Men’s Jeans. 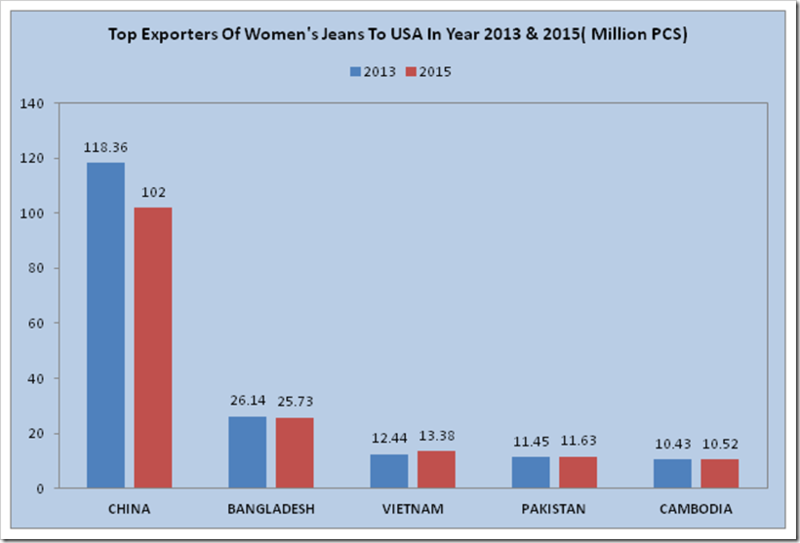 It exported merely 36.88 million pcs of Men’s Jeans to USA in 2013 while the Women’s Jeans was 118.36 million pcs which was 220.93% more than Men’s Jeans. 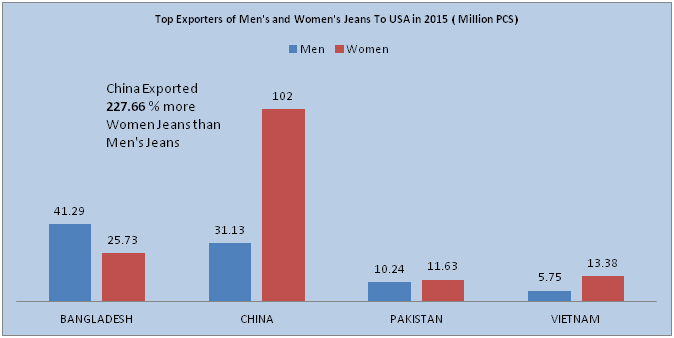 In 2015 , the difference in the export quantity of Men’s and Women’s Jeans was of 227.66%. 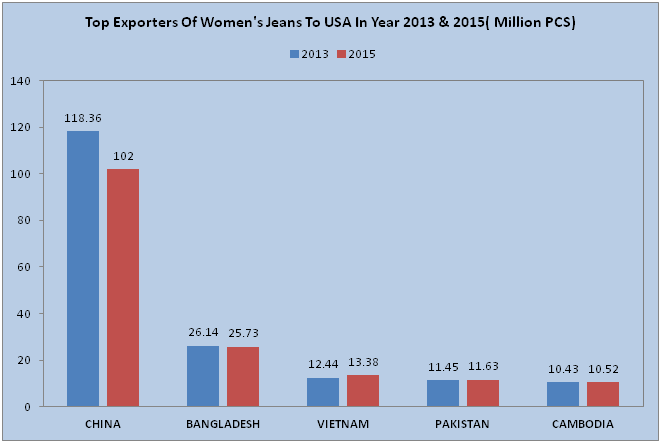 Except Bangladesh , all other countries exported more of Women’s Jeans than Men’s Jeans in both 2013 and 2015.